Minnesota-based folk-rock troubadour Mason Jennings has always gotten some of his appeal from his status as an independent musician: An undeniable sense of authenticity comes from not being beholden to a big record label. What he lost in a major's ability to fuel publicity and radio play, Jennings gained in an unfettered ability to make his earnest, emotionally rich, intelligent albums the way he saw fit. 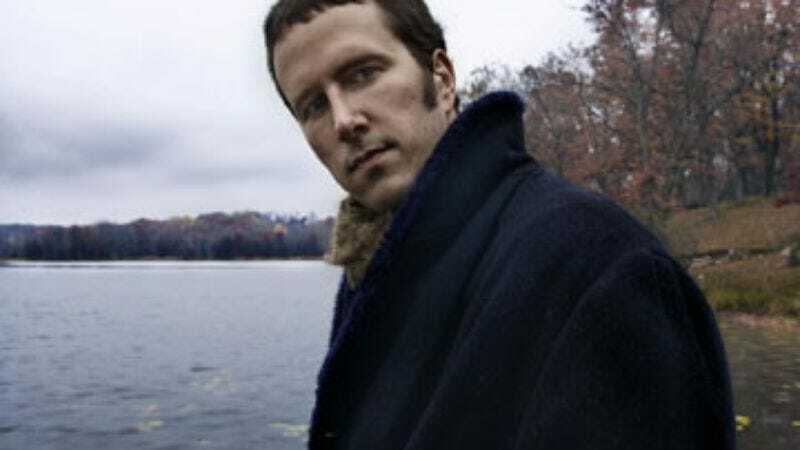 So it was a little surprising when the news came last fall that Jennings had signed on with Epic via the Glacial Pace imprint, run by Modest Mouse leader Isaac Brock. But fans needn't worry. His newly released fifth LP, Boneclouds, is warm, thoughtful, and perhaps Jennings' most deeply personal album yet. The A.V. Club talked with Jennings just before he departed on his current U.S. tour, which teams him with opener Teddy Thompson, son of folk royalty Richard and Linda Thompson. The A.V. Club: You've had offers from major labels before, but always turned them down. How did the move to working with Glacial Pace and Isaac Brock happen? Mason Jennings: Isaac asked me to come out on the road and open up for Modest Mouse on some shows last year. After the first show, he said, "Dude, I'm starting a label, and I want to help out people who do the music that I love, and get it heard by more people." And I was like, "No, dude." Because I'd turned down so many labels by this point that I thought it was okay to just keep doing it myself. But he kept talking to me about how it wouldn't change anything, except that I would have more resources and more time. He just kept talking about how Epic really helped him, because he got out to more people without them interfering at all. So I started thinking about it more, and it just made sense to me. I expended a lot of energy doing the label myself with my manager, and it's really good to have more help with that now. It's been really cool. AVC: Modest Mouse's music, superficially at least, isn't very similar to yours. What did you have in common with Isaac Brock that made you think it was the right choice? MJ: We both had similar struggles growing up, trying to turn darkness into light. We're really different people, but it seems like we've come from a similar place, trying to make the best out of our situations. AVC: What did he offer that you didn't have? MJ: More time in the studio. And then, also, he's somebody who's gone through this and made it work, to help me get through the weird parts. AVC: In the past, you've been a prolific songwriter, writing more songs than you've had room for on your records. Was it the same way this time? MJ: Yeah, there were a ton. I had 36 songs for this record, and I cut it down to 10. AVC: If I had to choose a single word to describe what this record is about, I'd say "faith." Do you think that's a fair assessment? MJ: Yes. I think so. For sure. I became a father [before] this record. I have two sons now. And just being on the road all the time—I was on the road for about five years straight, and at some point, something clicks inside your head and you think, "Man, I've got to figure out what's going on inside myself," as far as my personal faith. I think that happens a lot when people become parents, too. There's just so much at stake suddenly, and you're also witness to the total miracle of birth, and stuff like that. So I started reading tons of religious texts and checking everything out. One of the things I wanted to make sure of on the record is that it still has a "searching" vibe rather than an authoritative vibe. I certainly don't feel like I've figured much out, you know? AVC: There's a lot more personal songwriting on this record, including "If You Ain't Got Love," which is about your sons. MJ: I hadn't really written anything about those guys, about the idea of becoming a family and changing from dating someone to marrying someone to having kids. So I tried to sum it up in three verses, like little photographs of the journey from being married to moving to the next stage of your life. AVC: You mention in the lyrics that one of your sons had health problems when he was born. Is he doing well? MJ: Oh, yeah. Everything's good. It's a hard thing to be born. AVC: The song "Jackson Square" is about New Orleans, right? MJ: Yeah, but it's about before the flood, strangely enough. It's kind of got some flood imagery in there, but I wrote it a couple of years ago. It's a song about falling in love and then losing the person you love, a little fable about that. AVC: In the past, a lot of your songs have been written from the perspective of different characters, but Boneclouds comes more directly from yourself. Do you think that's going to be the direction of your future songwriting? MJ: On the next record, I think I'm not going to be writing as personal as this one. From time to time, I feel like I have to be personal, and now that I've done it, I feel kind of exhausted by it. [Laughs.] A little bit, you know. AVC: You've also been more overtly political in your songwriting in the past, but Boneclouds doesn't deal with that so directly. What's your sense of the climate for political songwriting? MJ: I think you've got to be careful. I think it's a really weird scene right now. I love Neil Young's new record. But at the same time, I think it's hard for me… I mean, I don't feel like taking sides. I want to think bigger than that. AVC: Do you have any trouble remaining optimistic in the current political climate? MJ: No, I guess I don't. I think the media's only showing us a little part of it. There's always good stuff going on. It always balances out. AVC: The album cover was done by Shepard Fairey of "Obey Giant" fame. Did you choose him? MJ: Yeah. I was so excited that he was able to do it. He was so fun to work with. We hung out after he got the record, and we were talking about opposites and things going back and forth. I wanted it to be like Cuban poster art, like on rough paper, and really colorful. And he had the idea of skulls in the ground. I told him I wanted skulls all over the place. I said "It feels like a really heavy record, you know?" And he was like, "Yep. I love skulls. Skulls can go all over it."